10. You’ll get to try new things, like typhoid fever and amoebas. No worries. Even if you’re the most vaccinated person you know, you just might get sick. On the bright side, most of the time your illnesses will sound cool. And cool illnesses make people pray more. But note: ulcers are not cool. If you get an ulcer, don’t tell anyone. Ulcers are too American. 9. Your kids will have friends from countries you didn’t know existed. And they’ll speak like them too. Our little girl loves the story of the “Ten Leopards.” You know, the one where Jesus healed ten leopards, but only one came back to say “thank you”? Thank you, you wonderful world of missions, for giving our children such a linguistic advantage and wide worldview. 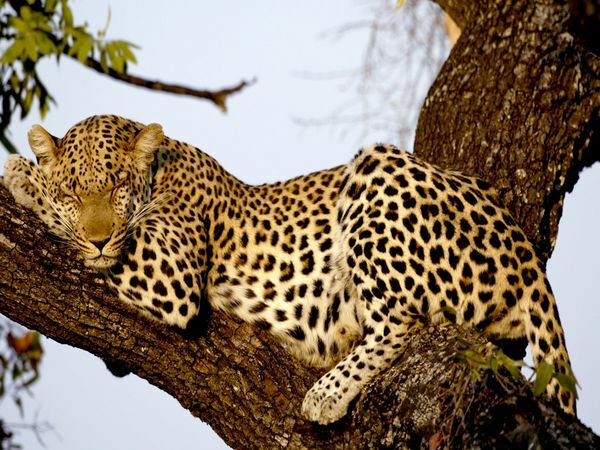 A worldview in which Jesus cares so much about jungle animals, he sometimes heals ten at a time. Lights on for safety, or lights off to keep the evil spirits from seeing you? Even at night? Or lights on during the day because you really were wanting to impersonate a VIP and get pulled over by the police? I mean, who knew driving 20mph (or 32kph for those of you who don’t know how to measure stuff correctly) could be so exhilarating. And when the door falls off of your ancient Toyota, just hold on to it and keep moving. And sometimes, cars on the mission field actually get younger, with fewer miles on them than when they were imported. What a cool perk. 7. You’ll learn to be grateful for the little things, like cheese and toilet paper. Despite YouTube tutorials aplenty, how exactly billions of people lived (and still live) without toilet paper remains a mystery. Be grateful, people. Older missionaries in my part of the world remember when cheese came to town. Cheese and stop lights apparently arrived at the same time. So if you’re in a part of the world without cheese, extra points for you. And may I recommend you start praying for a stop light? 6. Your bargaining skills will improve…with the police. This becomes necessary if #4 doesn’t work. Life’s simpler here, really. The police don’t want to write you a ticket, and you don’t really want to pay a ticket. And everyone knows you didn’t really violate a law anyway. Some officers are harder than others, requiring rare delicacies from the West. One time, a pot-bellied officer demanded beer money. I offered Twizzlers. He pondered for a second and counter-offered with four fingers. I complied and drove off. In my rearview mirror I saw him and three buddies chowing down. Apparently, Twizzlers make mouths (and cops) happy. 5. Your children will learn how to whine in multiple languages. The ability to whine, out loud, in front of other people, without them knowing, is the gift of a lifetime. Just be sure to teach your kids to do a quick perimeter check for possible same-language listeners within earshot. A hotel worker didn’t do a proper perimeter check once, and I clearly heard him complaining about some rude tourists, “Sure, why don’t they just go sunbathe by the pool. I hope a massive rock falls off the building and smashes their heads.” Oops. I made a mental note to self: speak extra nice to that employee. Your new language will also allow your family to share bodily function jokes all throughout furlough. Very bonding, really. And if your kids aren’t learning the local language, may I at least suggest your family learns the words and/or euphemisms for passing gas. Especially if you have boys. Their childhood will be grossly enhanced. Really though, this one’s most useful during furlough. Can’t figure out the ATM? or the drive through? or Wal-Mart? Just smile, mumble something in another language about massive rocks smashing things, and say “I’m not from around here.” But don’t forget your perimeter check. 3. Fashion rules will no longer apply. You ever seen a missionary? Yeah. 2. You’ll get to report to hundreds of people, every month, details about your work, your family, and how you spend your money. Who needs Dave Ramsey when you have the entire deacon board of multiple churches analyzing your finances? It’s accountability on huge quantities of steroids. They may ask why you need so much, or why you have to pay for your kids’ education, or why you save for retirement, but at the end of the day, they are paying you to do this thing we call missions. It’s an honor to serve, even when the reports are due, the power’s out, it’s hot season, the spreadsheet’s rebelling, and you can’t figure out how to get that docx into a pdf into an html into a mobile-friendly, print-friendly, e-mail-friendly format. But hey, at least you don’t have to use envelopes. 1. You’ll get to experience the raw joy of crossing language barriers, cultural barriers, time zones and comfort zones, simply to invite someone to follow Jesus. Maybe you preach the gospel straight up, street-corner style. Maybe you serve the sickest and the poorest, touching the folks no one else wants to touch. Maybe you teach English or a vocation, aiming to empower. Maybe you do a thousand things for economies or community health or justice. But there is one Love that draws us together and pushes us out the door. Every day. His name is Jesus, and at the end of the day, He is worth.it.all. An updated version of this article appeared on A Life Overseas in May 2014. If you liked this, check out More Reasons You Should Be a Missionary. hilarious – and so true. i don’t think my family thinks my driving skills have improved at all – quite the opposite! Love it! They are all so true! We’ve enjoyed Phnom Penh as well, and I especially love the point about “fashion”, because it is so liberating here in Cambodia! ha! One of the things that concerns me the most about returning to the States is learning how to coordinate again! We’re flying out on the 21st – wish I would have come across your info before, perhaps we could have had coffee. Your name sounds familiar though. Maybe if we are able to return some day we can look you up for connection. God bless you in your ministry and thank you for loving these beautiful people in the Kingdom of Cambodia! Hey there, Mark! I’m so glad someone else appreciates the glory of living free of fashion. : ) I saw on your blog that you used to be involved with youth ministry. Me too. Perhaps that explains the kindred spirit thing. Anyway, yeah, if you find yourself on this side of the planet again, let me know and we’ll catch up over some coffee or something. Came to read this from a friend’s FB link, and want to reinforce that all these things are also true in Tanzania! We live in a town without cheese still (although it’s only 4 hours away, which isn’t too bad), so I’ll be praying for a stoplight, which will, of course, be completely ignored by everyone in town anyway. Love this! But we drive 10 hrs and around The Gambia to get to the capital here in Senegal to get cheese….and Dr Pepper, and Root Beer. SOOOOO worth it, as long as our deep freeze will freeze it! As a matter of fact we are making that trek up in a few weeks. Where’s an MAF plane when you need it? At least it’s a pretty drive, right? : ) But seriously, 10 hours?! Great post, Jonathan. I chuckled at the bit about how much Jesus cares about jungle animals. 🙂 I so appreciate the approach you and Elizabeth have had with this whole thing: relaxed combined with realistic. Seems like the only way to survive, really. Haha, well for me, that would be reason #11 to be a missionary. Your favorite team’s games will NEVER be blacked out on MLB.TV because you’re nowhere near the local market! I LOVE this! My family and I are missionaries in Ecuador, South America. I LOVE the positive spin on everything-even the amoebas because that is exactly how we look at parasites and amoebas! Thank you for answering the call to missions and for sharing your sweet humor! Blessings on your ministries! 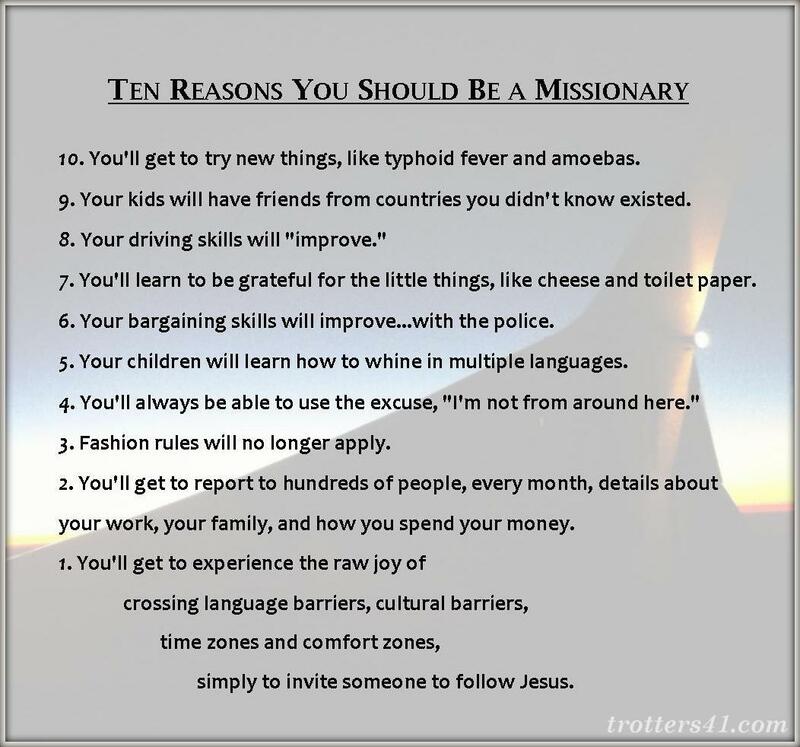 10 Reasons You Should Be a Missionary… SO TRUE!!! Thanks for this! #6 was spot on but #2 confused me… you guys save for something called “retirement”? We do have cheese here in Zambia but most of the traffic lights (called robots) are usually broken – which actually makes the traffic work better – so we got it all! This is classic! Loved it. This post made me laugh out loud. More than once. “I mean, who knew driving 20mph could be so exhilarating.” Never a truer word was spoken!! I meant #10, not #1. This was Awesome!! I loved every one!! Loved it! So many funny kids stories too. One of our funniest was the first furlough when our 2 and 4 year olds slipped off their shoes before getting onto an elevator. Short term ‘visits’ I guess I call it but whatever you call it, I understand honking, lack of traffic lights or robots, electricity,,,what is that?, one cup of water per bath; who needs cutlery anyway; A blow wave means standing facing into the wind; I will eat most anything but not those little fishes with the big eyes! Thanks Jonathan for a great laugh! Fabulous! Pretty sure these are all true of mission work in the Philippines as well. If you get the urge add to your list, be sure to add “You will learn many invaluable uses for the humble motorcycle”. I’m SURE you know what I mean! You mean, like “vehicle for family of 6,” or “refrigerator transport,” or “large pig hauler”? Yeah, I get it. : ) It’s pretty awesome. Really enjoyed this – 13 years in Papua New Guinea, lots in common. Well done! Thanks, Geoffrey! I grew up on tales from MAF, and it seemed like a good portion of those tales came out of PNG. Hope to visit someday! Thanks for sharing. Most items apply here in Mexico too, although we do have Wal-Mart. We just sent a bottle of grasshopper hot sauce back to the States with a friend. I think that might apply to the eating something strange department. Keep up the good work. You mean that traffic’s different in the middle of Canada? No way. : ) So glad to get to know you and your family, and happy two month anniversary! Just came across this after spending time in Phnom Pehn on a mission trip this past summer. Love your post and the video of the traffic. “Synchronized chaos” is how one local missionary described it. That is a PERFECT description of the traffic! : ) Thanks for the comment, Vera! Wow! This is so great! I am an MK, my family was in Chad, Africa. I lived there for all my primary years. I love #2 – there is nothing like putting your financial life in other people’s hands and hope they don’t judge you for what you are doing. This is a great list – I wish I could have come across it sooner. God bless your work! I love this! It is so true. I have tried following your blog before but for some reason it didn’t work. Your blogs always make me smile! Hey there! Sorry about the tech problems, but it looks like it worked this time. : ) Thanks for stopping by! — Jonathan T.